Yesterday, we took a look at the volcano Pillan Patera and its surroundings prior to its eruption in 1997. In our look back, I took you all the way to April 1997, on the eve of the eruption. To that point, Pillan had been a fairly nondescript, 75-kilometer (47-mile) wide patera that only been seen as a weak thermal hotspot on a pair of occasions in November 1996 and February 1997. This would change beginning in May 1997, when the Near-Infrared Spectrometer (NIMS) onboard the Galileo spacecraft detected a much brighter hotspot at Pillan, suggesting that a major eruption had begun. Later modeling by Davies et al. suggested the presence of lava with a temperature of at least 1500 K covering an area of 0.2 square kilometers (50 acres). Such high temperatures are consistent with large lava fountains or turbulent lava flows, where massive amounts of extremely fresh lava could be detected. Despite the detection of a bright eruption at Pillan by NIMS during Galileo's G8 orbit, Pillan looked no different in distant images taken by the SSI camera than it had in earlier orbits. This suggests that the Galileo observations on May 7, 1997 captured the eruption at a very early stage, before any large lava flows had formed. This is validated by the low-temperature component in the Davies et al. paper on the eruption styles of Pele and Pillan, which found the area of fresh lava flows 5-10 minutes old covered an area of 31 square kilometers (12 square miles). This provides another link to the East Girru eruption seen by New Horizons 10 years later. New Horizons also appeared to have caught that eruption in its early stages, before it had a chance to produce any major surface changes. Perhaps if we were to revisit Io today, a fading pyroclastic deposit and lava flows field would be seen around the East Girru fissure. 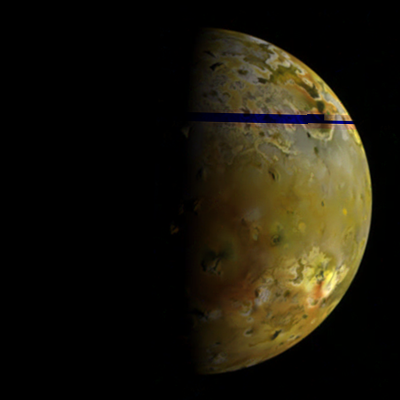 Galileo returned to the inner Jupiter system in late June 1997 during orbit C9, allowing Io to be observed in daylight and in eclipse on June 28, 1997. 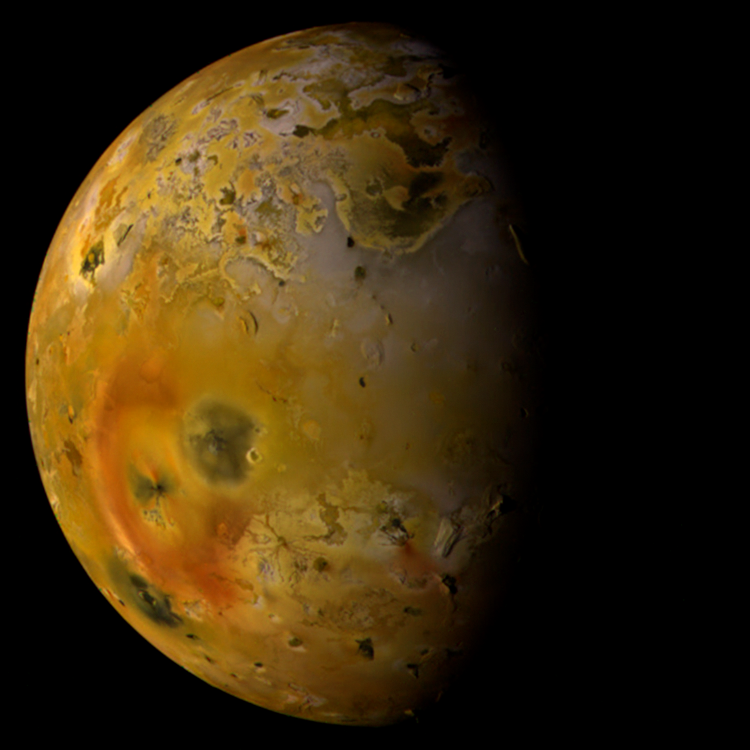 In the case of the daylight image, shown above, a new plume ~110 kilometers tall was observed over Pillan on the limb of Io. Before that observation, no plume had ever been observed at Pillan. In fact, when Hubble imaged the Pillan plume on July 22, 1997, it was initially thought that the plume came from the nearby Reiden Patera. 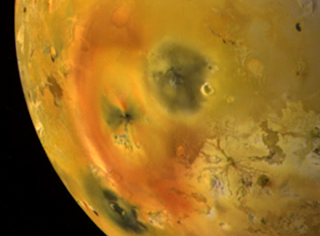 Unlike the plumes from other outburst eruptions such as at Grian Patera in 1999 or Tvashtar Patera in 2007, rather than being a large, gas-rich plume, Pillan's plume was much more dust-rich, approaching Prometheus's prominent plume in brightness and mass (see Geissler and McMillan 2008). 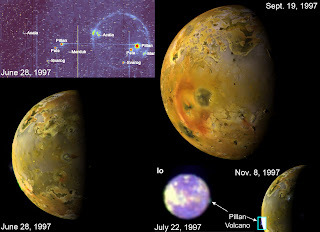 By analogy with similar plumes on Io, this suggests that the Pillan plume resulted from the interaction between hot silicate lava and cold sulfur dioxide frost on the surface of the plains the lava flowed over, rather than direct outgassing from a volcanic vent. 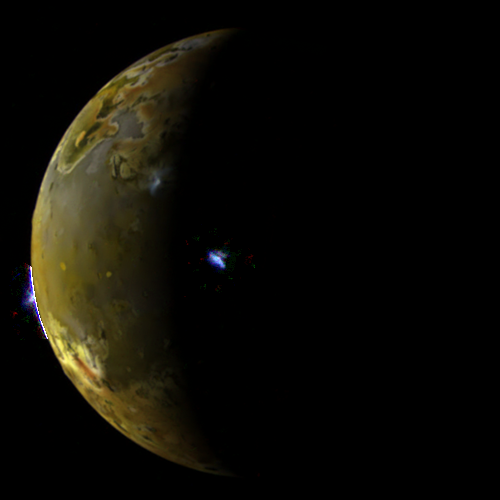 Pillan was also seen in eclipse images taken 16 hours later. Again, evidence that an intense eruption was taken place at Pillan was observed. An intense hotspot was seen over the volcano in both SSI and NIMS data (though the low resolution of the later meant that the NIMS pixel covering Pillan also covered the active Pele volcano). Initial modeling from the SSI and NIMS C9 observations provided tight constraints on the eruption temperature of Pillan's lavas, suggesting temperatures that were above the range of terrestrial basalts, but were instead in the temperature range of ultramafic lava, last seen on Earth two billion years ago. These temperatures, 1800-1900 K (lower limits actually), also caused problems for modelers when it came to the amount of melt required in the Ionian asthenosphere. Tidal heating models required a mantle with a much smaller melt fraction than would be required by the super high eruption temperatures estimated for Pillan. However, more recent modeling by Keszthelyi et al. 2007, that better accounts for lava fountaining, now place a lower limit on the eruption temperature at Pillan closer to 1610 K, within the range of terrestrial basalts. The first visible images of the effects of the eruption came on September 19, 1997, when Galileo returned to the inner Jupiter system for the 10th time. This multi-spectral set (10ISIOGLOC03) revealed a dark spot more than 400 kilometers (250 miles) across and a fresh lava flow with an area of 3,100 square kilometers (1,200 square miles). This data allowed researchers to better understand the geologic context for the eruption. Rather than being located with Pillan Patera, the eruption started from a fissure located to the north of the volcano. Fresh lava flows extended south and east from the southern end of this fissure. The dark spot that surrounded the Pillan lava flows were likely the result of pyroclasic flows that hugged the ground and deposited a thin layer of dark basaltic tephra. This hypothesis is supported by the visible and near-infrared spectra of this deposited, as derived from this image set. Geissler et al. 1999 found evidence for iron-rich orthopyroxene (enstatite end-member), a mafic mineral, within the dark deposit. NIMS and SSI observations of Ionian hotspots in September 1997 also revealed that the eruption was still on-going, with significant areas of incandescent lava still visible. Galileo took a few more peaks of Pillan in late 1997 and early 1998, as the spacecraft began its first extended mission. In November 1997, SSI observed Pillan's plume, fainter and slightly taller than it was June of that year, as well as the thermal emission from the volcano during an eclipse observation. This time, two hotspots were seen: one corresponding to the source fissure and a brighter one to the south corresponding with the southern portion of the flow field and Pillan Patera. This suggested that lava from the Pillan eruption was flowing over the edge of the patera and down onto the floor of Pillan Patera, like a two-kilometer tall lava fall. Sure enough, this was confirmed four months later, when Galileo SSI observed Pillan at only 2.6 kilometers (1.6 miles) per pixel. The floor of Pillan Patera had darkened, likely from lava from the eruption flowing down from the north and covering the 2,500-square-kilometer (950-square-miles) patera floor. Thus, by March 1998, the Pillan eruption of 1997-1998 had resulted in 5,600 square kilometers (2,200 square miles) of new Ionian terrain. Assuming an average thickness of the lava flow was 10 meters (a reasonable number given later observations), then more than 56 cubic kilometers (13 cubic miles) flowing from the source vent during the eruption. For comparison, the Laki eruption in Iceland in 1783, one of the largest eruptions ever observed on Earth, produced more than 14 cubic kilometers (3.4 cubic miles) of lava. Believe it or not, there is just too much to talk about with respect to Pillan to cover in just TWO blog posts. More specifically, I am tired and hungry, so I am going to cut this installment short. But have no fear, I will be back tomorrow with a discussion of the high resolution observations of the Pillan flow field from Galileo and more recent observations of the volcano.